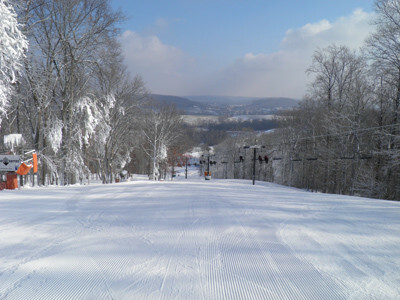 Ski Paoli Peaks is an Indiana favorite. The snowmaking system allows the resort to make 12 inches of snow in one night over the entire 65 skiable acres. Paoli Peaks welcome riders. They have two terrain parks and halfpipe. It draws numerous skiers from Indianapolis, Bloomington (home of IU), and Louisville. There's also a Tubing Park. Self service restaurant, pizzeria; lounge at the French Lick Springs Resort, 10 miles; bars and entertainment at French Lick Springs. Childcare available nearby. First aid at area, hospital 1.5 miles. Ski and snowboard rental and repair available at area. Ski instructions offer packages for children and handicapped skiers. One hundred percent snowmaking.